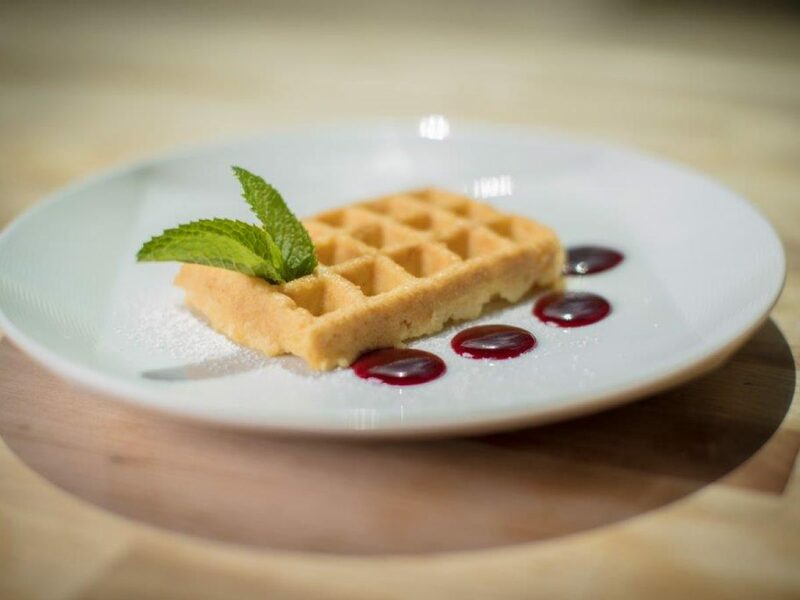 Be creative, be respectful to those who require modified diets, and have fun! 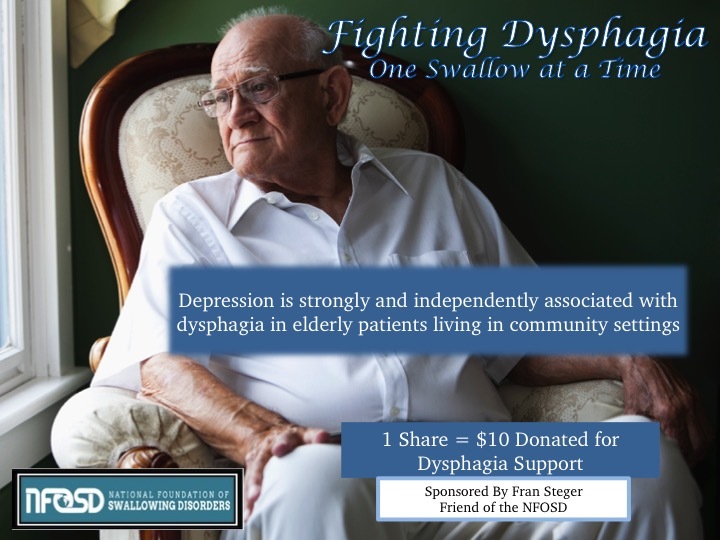 Entries can be submitted by anyone: an individual, a corporation, a restaurant, a group of friends, a healthcare organization, a family! Entries must be original. You cannot share a video that you did not create. 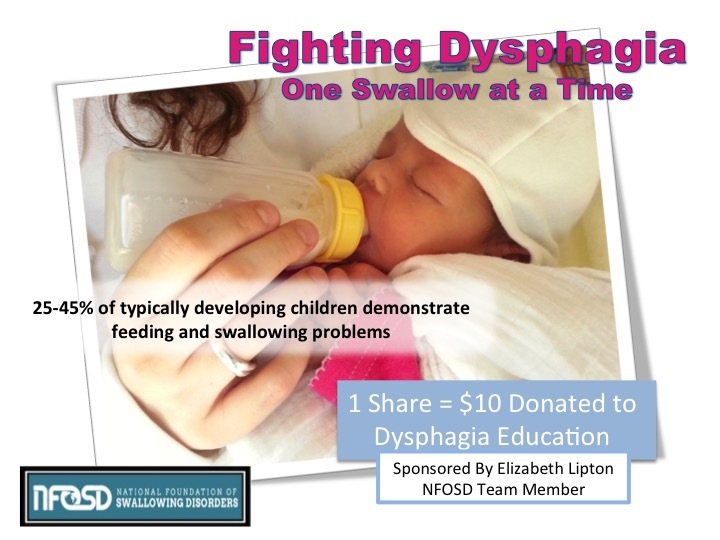 In order for IDDSI and the NFOSD to view entries, you must include #IDDSIchallenge and tag @NFOSD. Entries must be submitted by June 20th, at midnight GMT. 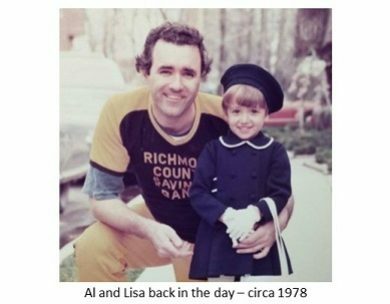 By submitting a photo, you are confirming that anyone pictured has provided their consent for this to be shared publicly. 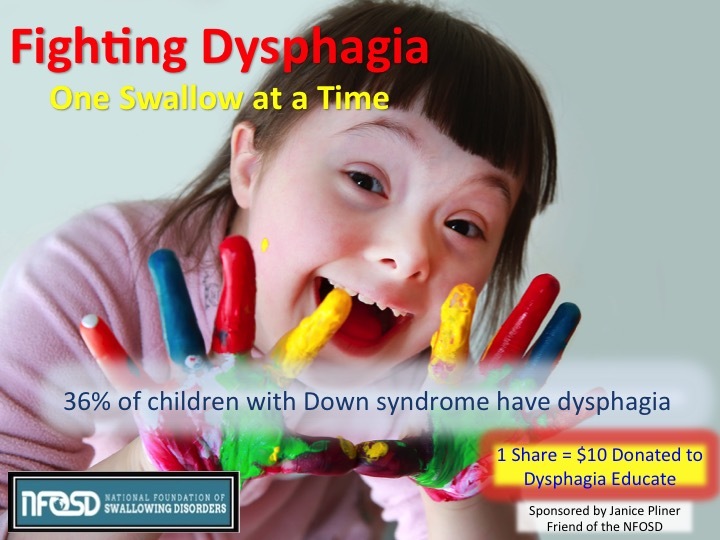 By submitting a photo, you allow the NFOSD and IDDSI to share and reuse this on their websites, social media platforms, and with their mailing list. We will ask any inappropriate photos to be removed and reserve the right to not share these with our community. 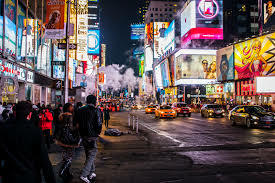 Any disrespectful or inappropriate comments on photos submitted will be deleted. 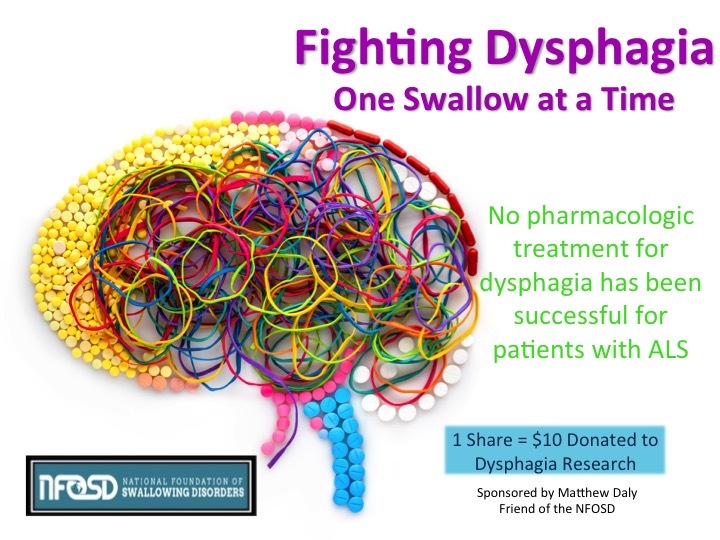 Winners will be announced on the NFOSD and IDDSI social media platforms. 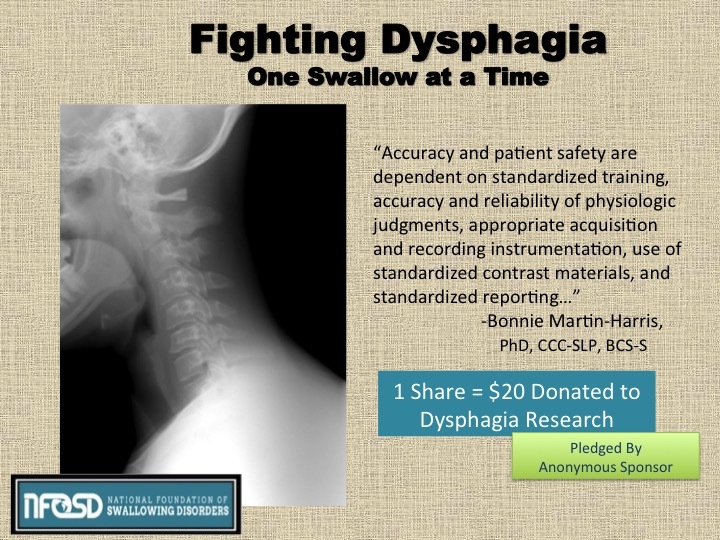 Course Summary (0.6 CEUs): This comprehensive one-day live streaming dysphagia course was presented by 12 clinical and research swallowing disorder experts on February 28, 2017. 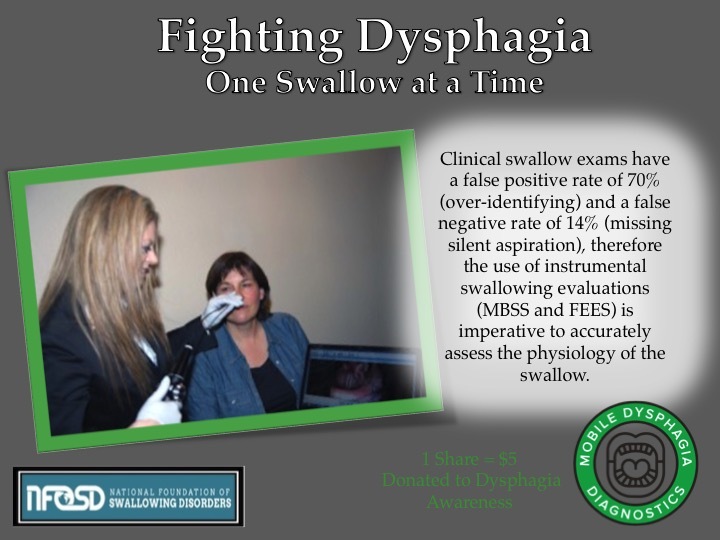 The course begins with a review of the basics of the normal swallowing mechanics, taking neurology and age into consideration. It then moves into evaluation techniques, coping mechanisms, and diet modifications. 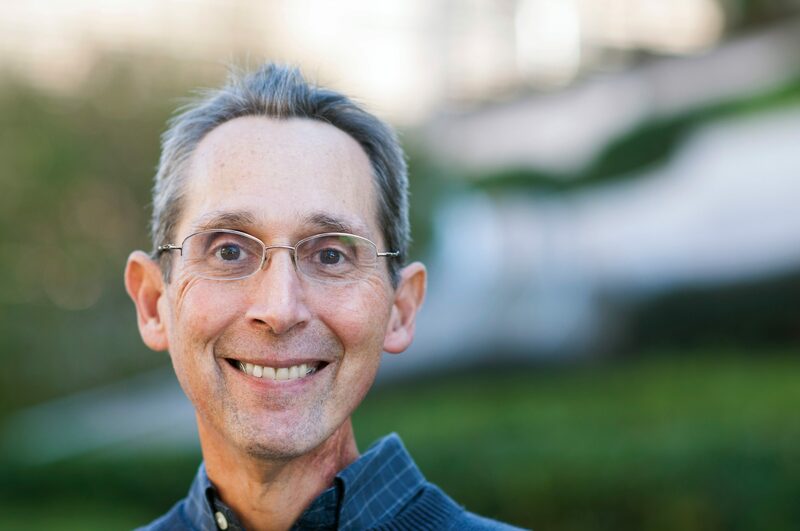 From there, we move into rehabilitation and address exercises, device-driven options, and biofeedback techniques. 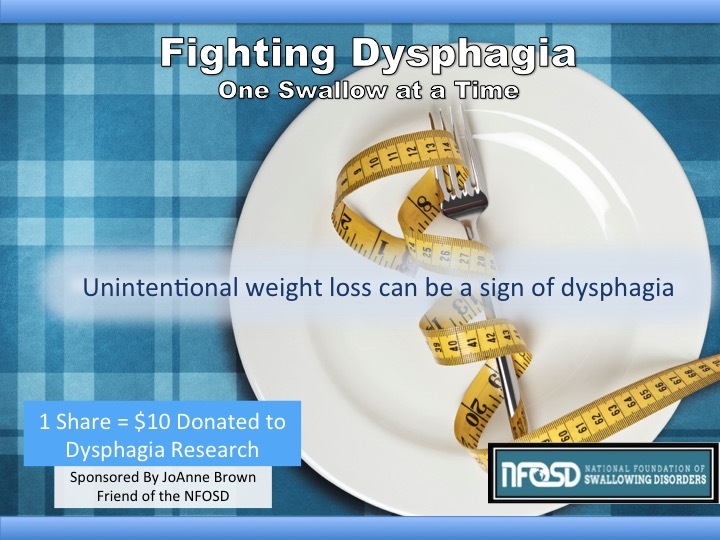 It wraps up with surgical options, methods for staying healthy, and a panel discussion on living with dysphagia. 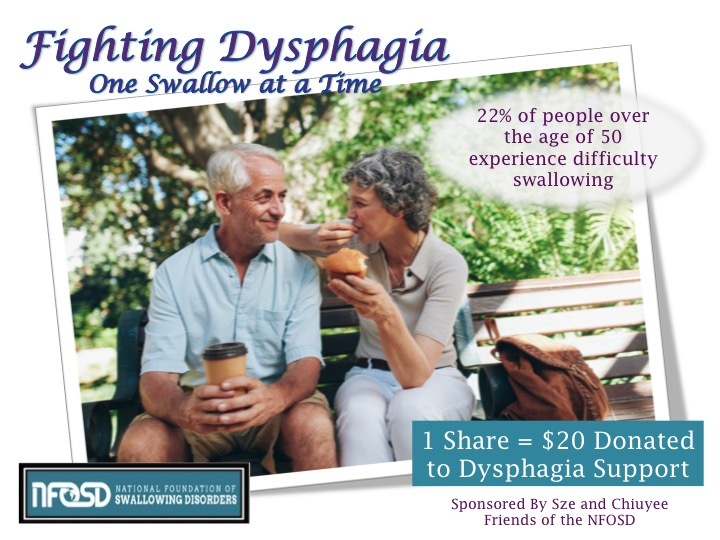 June is National Dysphagia Awareness Month. 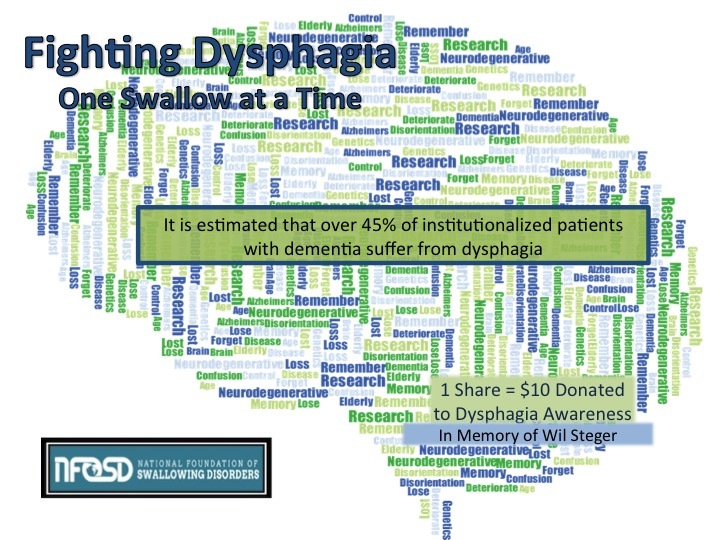 Each day during the month of June, we will share a photo fact about dysphagia that is supported by research. We will include a citation for each fact if you are interested in learning more. Citation: Field, D., M. Garland, and K. Williams. “Correlates of specific childhood feeding problems.” Journal of paediatrics and child health 39.4 (2003): 299-304. Citation: Holland, G., et al. 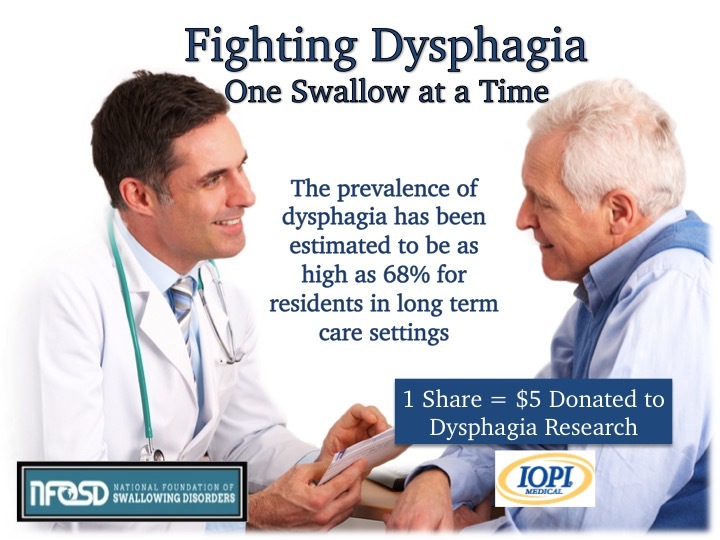 “Prevalence and symptom profiling of oropharyngeal dysphagia in a community dwelling of an elderly population: a self‐reporting questionnaire survey.” Diseases of the Esophagus 24.7 (2011): 476-480. Citation: Steele, Catriona M., et al. 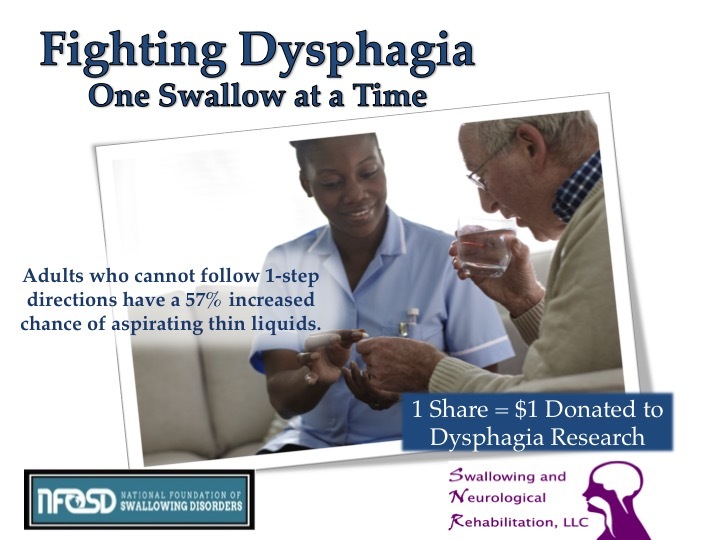 “Mealtime difficulties in a home for the aged: not just dysphagia.” Dysphagia 12.1 (1997): 43-50. Citation: Lindgren, Sven, and Lars Janzon. 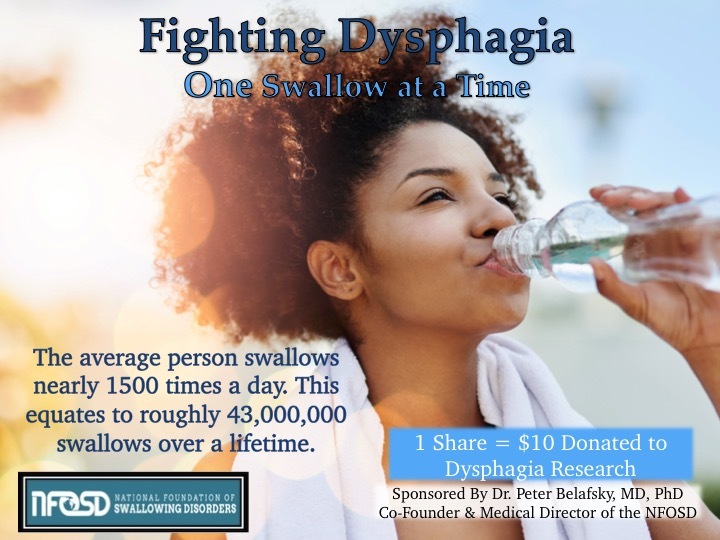 “Prevalence of swallowing complaints and clinical findings among 50–79-year-old men and women in an urban population.” Dysphagia 6.4 (1991): 187-192. Citation: Martin-Harris, B. 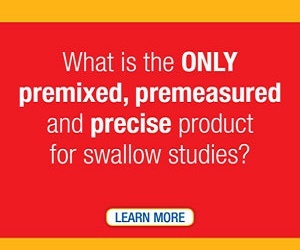 (2015) Standardized Training in Swallowing Physiology – Evidence-Based Assessment Using the Modified Barium Swallow Impairment Profile (MBSImP) Approach. Gaylord, MI: Northern Speech Services. Citation: Sura L, Madhavan A, Carnaby G, Crary MA. 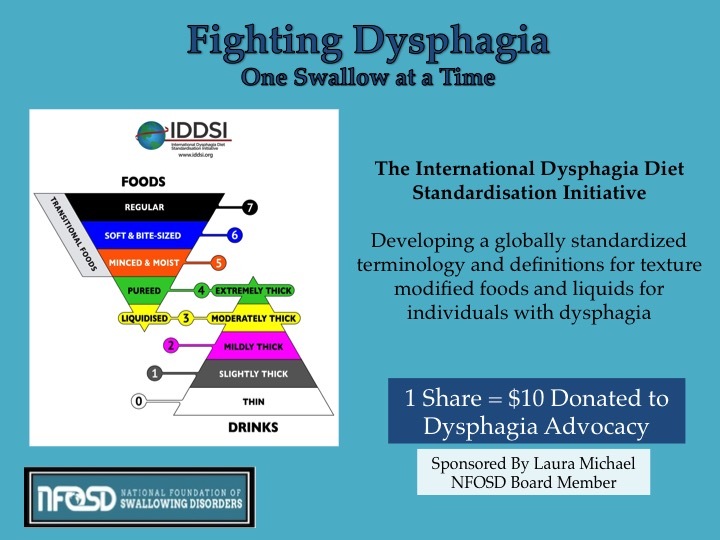 Dysphagia in the elderly: management and nutritional considerations. Clinical Interventions in Aging. 2012;7:287-298. doi:10.2147/CIA.S23404. Citation: Policy, Enteral Nutrition ASPEN Public. 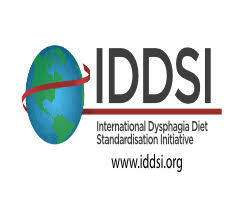 “Disease-related malnutrition and enteral nutrition therapy: A significant problem with a cost-effective solution.”Nutrition in Clinical Practice 25.5 (2010): 548-554. Citation: Dettelbach, Mark A., et al. 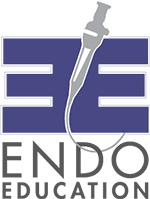 “Effect of the Passy‐Muir valve on aspiration in patients with tracheostomy.” Head & neck 17.4 (1995): 297-302. Cameron, J. L., J. Reynolds, and G. D. Zuidema. “Aspiration in patients with tracheostomies.” Surg Gynecol Obstet 136.1 (1973): 68-70. Citation: Rosenthal, David I., Jan S. Lewin, and Avraham Eisbruch. 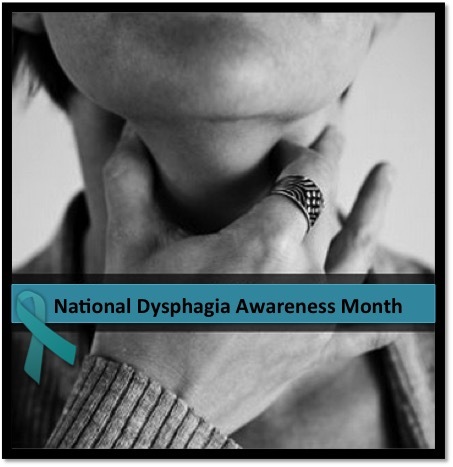 “Prevention and treatment of dysphagia and aspiration after chemoradiation for head and neck cancer.” Journal of clinical oncology 24.17 (2006): 2636-2643. 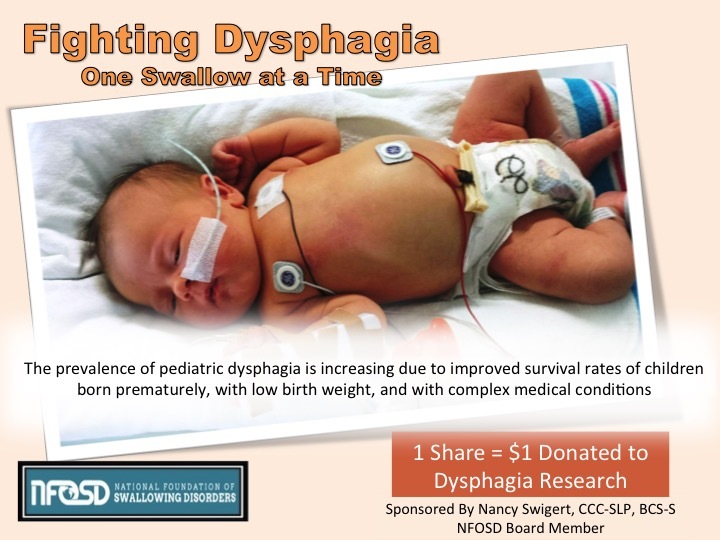 Citation: Arvedson, Joan C. “Assessment of pediatric dysphagia and feeding disorders: clinical and instrumental approaches.” Developmental disabilities research reviews 14.2 (2008): 118-127. Citation: Ramqvist, Torbjörn, and Tina Dalianis. 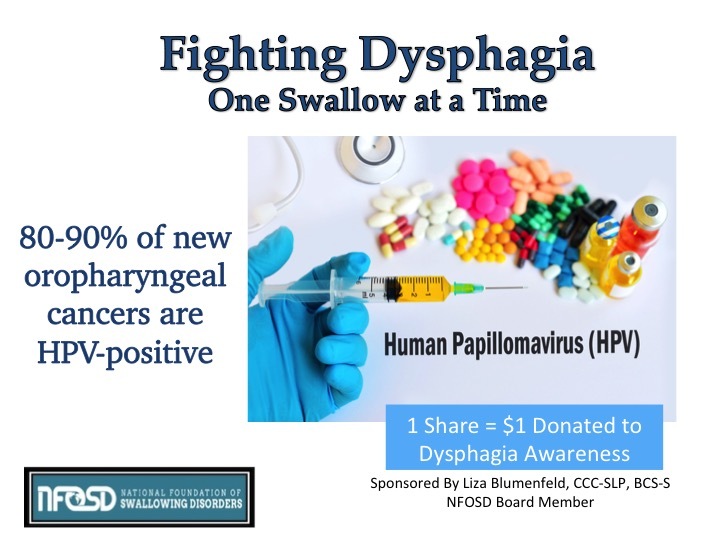 “Oropharyngeal Cancer Epidemic and Human Papillomavirus-Volume 16, Number 11—November 2010-Emerging Infectious Disease journal-CDC.” (2010). Citation: Paciaroni, Maurizio, et al. 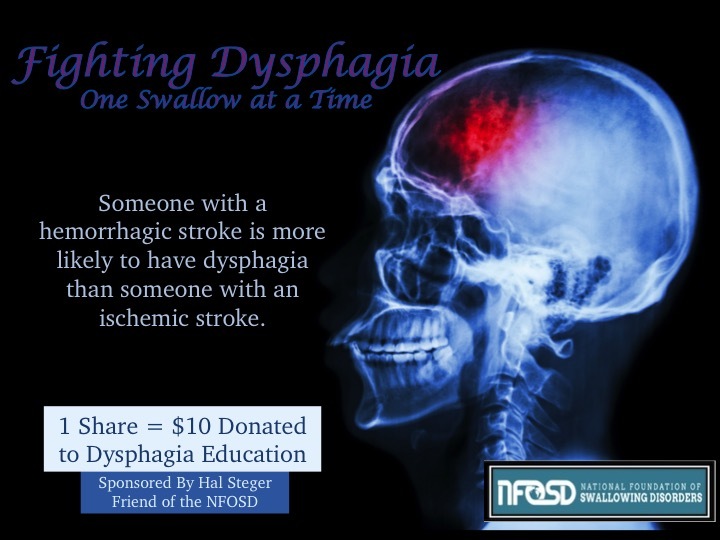 “Dysphagia following stroke.” European neurology 51.3 (2004): 162-167. Citation: Baumann, Brooke, et al. 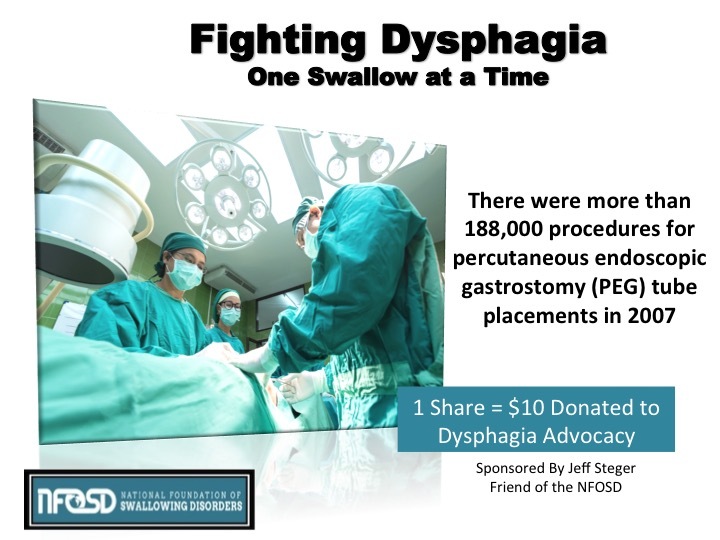 “Postoperative Swallowing Assessment After Lung Transplantation.” The Annals of Thoracic Surgery (2017). Citation: Rogus‐Pulia, Nicole, et al. 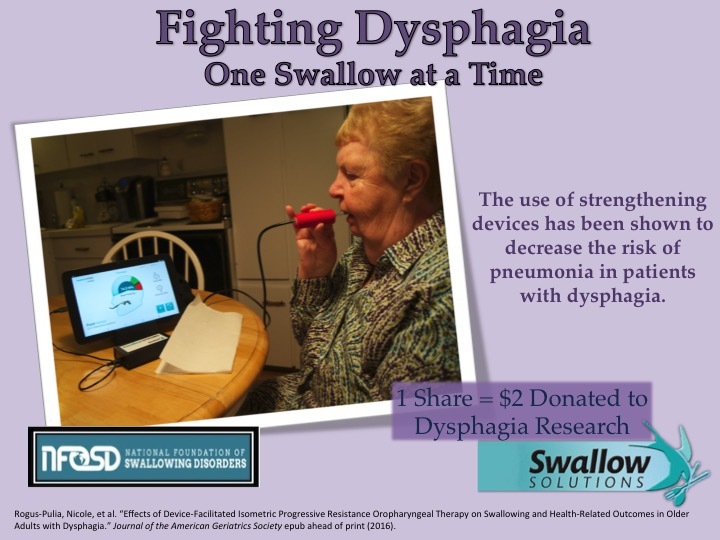 “Effects of Device‐Facilitated Isometric Progressive Resistance Oropharyngeal Therapy on Swallowing and Health‐Related Outcomes in Older Adults with Dysphagia.” Journal of the American Geriatrics Society epub ahead of print (2016). Citation: Nguyen, Nam P., et al. 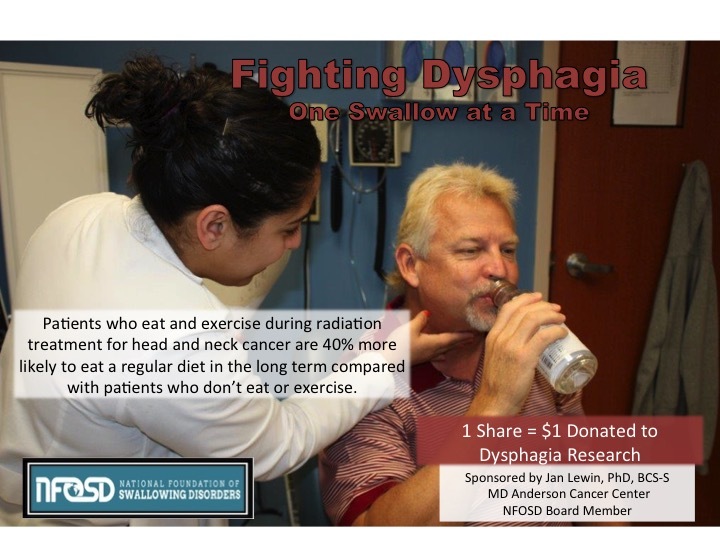 “Impact of dysphagia on quality of life after treatment of head-and-neck cancer.” International Journal of Radiation Oncology* Biology* Physics 61.3 (2005): 772-778. 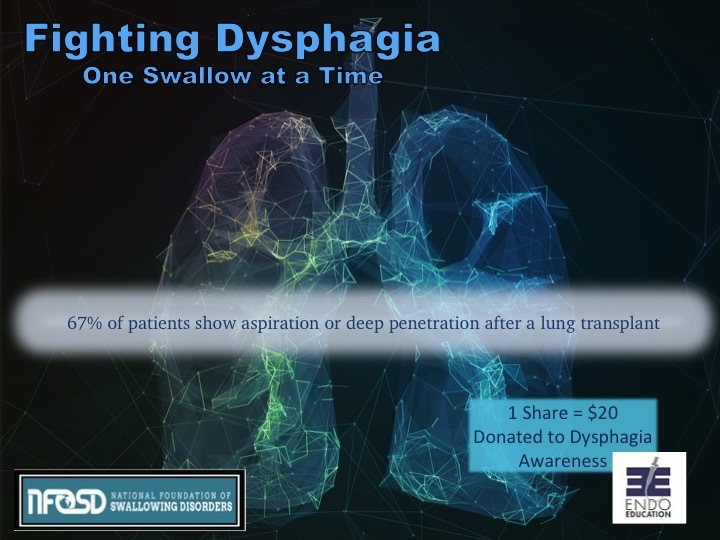 Citation: ALS dysphagia pathophysiology: Differential botulinum toxin response; Restivo, Domenico A. MD, PhD; Casabona, Antonino PhD; Nicotra, Alessia MD, PhD; Zappia, Mario MD; Elia, Maurizio MD; Romano, Marcello C. MD; Alfonsi, Enrico MD; Marchese-Ragona, Rosario MD, PhD 2013. Citation: Good-Fratturelli, Misty D., Richard F. Curlee, and Jean L. Holle. 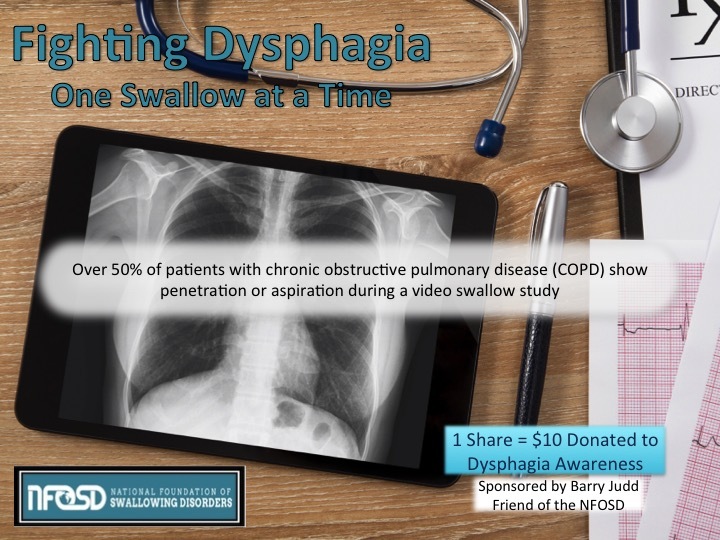 “Prevalence and nature of dysphagia in VA patients with COPD referred for videofluoroscopic swallow examination.” Journal of communication disorders33.2 (2000): 93-110. Citation: Muller J, Wenning GK, Verny M, et al. 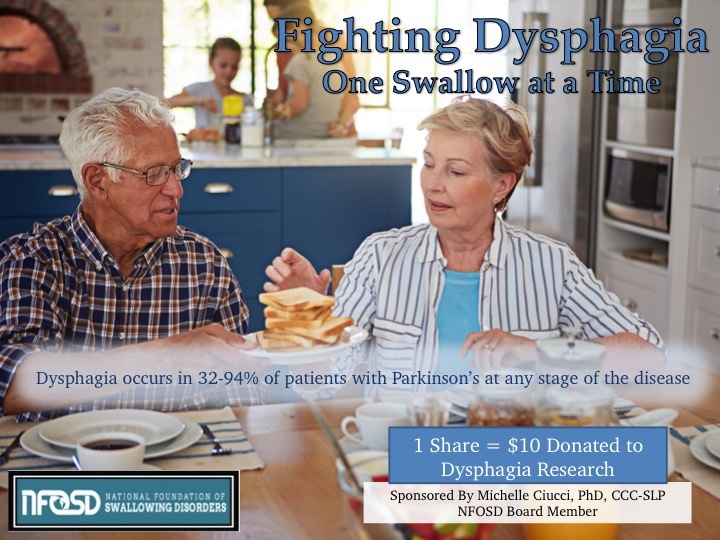 Progression of dysarthria and dysphagia in postmortem-confirmed parkinsonian disorders. Arch Neurol. 2001;58(2):259–264. Citation: Martino, Rosemary, et al. 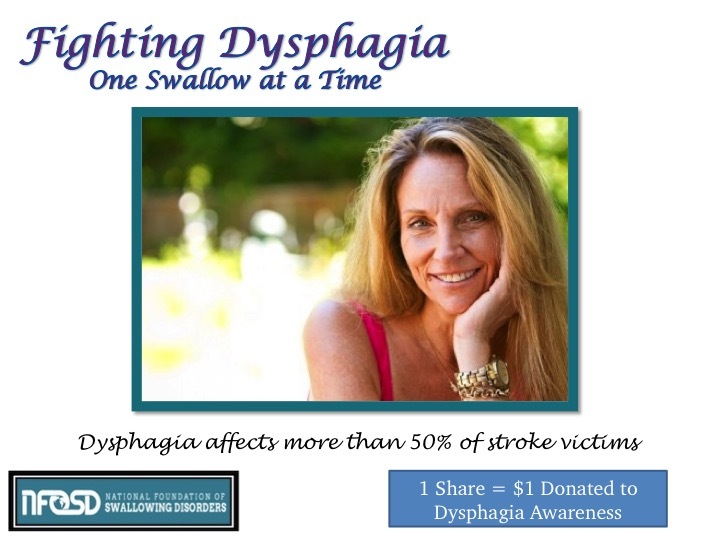 “Dysphagia after stroke.” stroke 36.12 (2005): 2756-2763. Citation: Leder, Steven B., and Julian F. Espinosa. 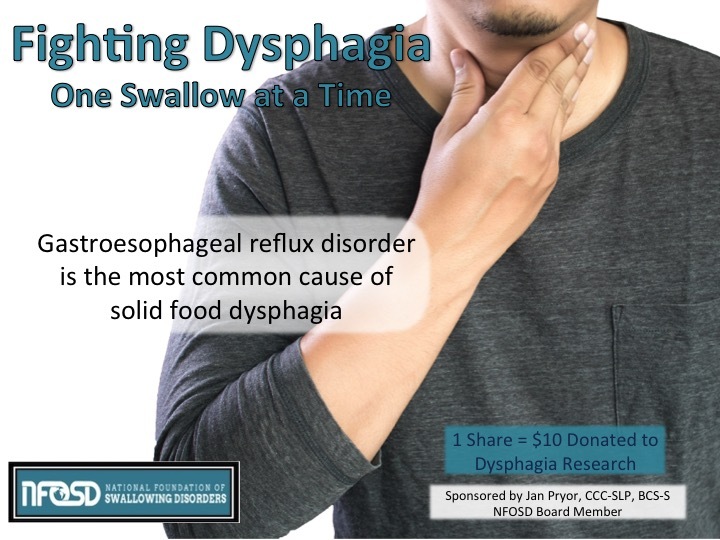 “Aspiration risk after acute stroke: comparison of clinical examination and fiberoptic endoscopic evaluation of swallowing.” Dysphagia 17.3 (2002): 214-218. 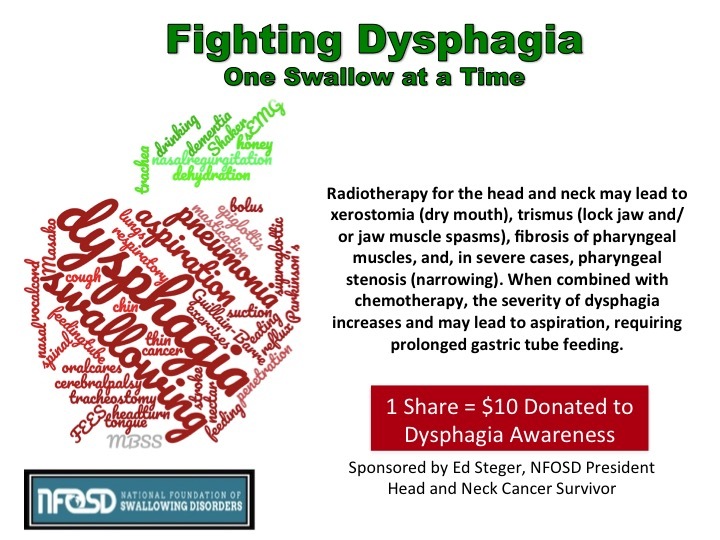 Cook Medical interviews NFOSD President, Ed Steger, about his journey with head and neck cancer and his mission to raise awareness of dysphagia, a devastating disorder.